"I don't know, fly casual!" "Don't everyone thank me at once." These are only a few of the great lines uttered by the famous Han Solo while traveling the galaxy saving the Rebellion, and sometimes being a scoundrel. No matter what, it's always entertaining. 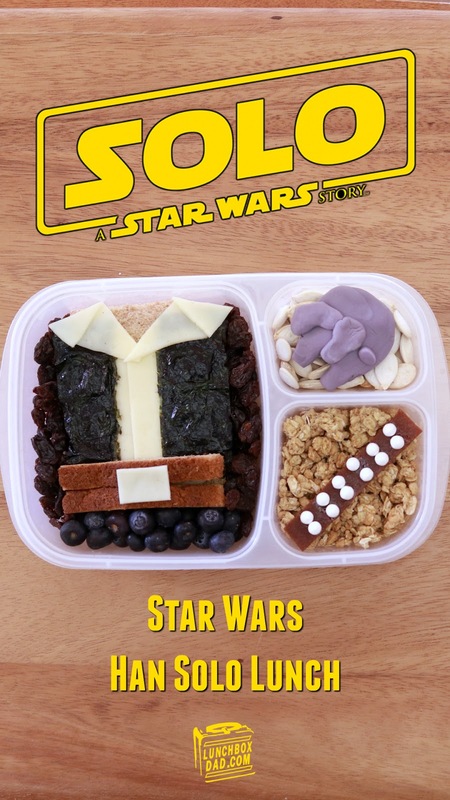 Since my kids and I always crack up at Han, and the new Solo movie is coming out soon, I figure it was about time to figure out how to make a Han Solo lunch. There are a few key pieces to this meal so I made a video to show the Chewbacca part. You can view it below. You can find out how I made the rest by reading my instructions below. I made this lunch in an Easy Lunch Boxes container. 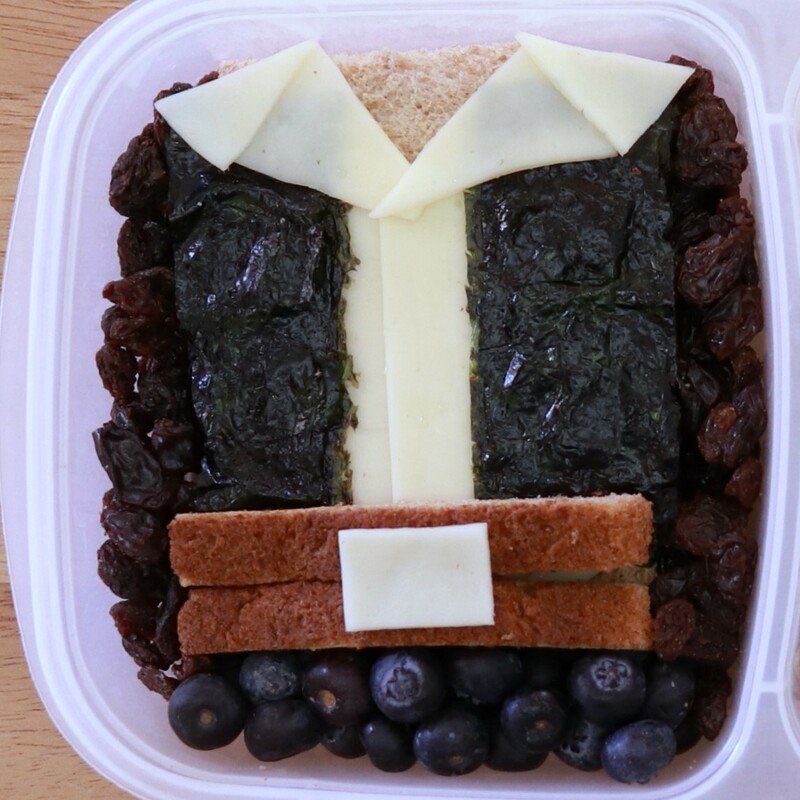 Ingredients: Whole wheat bread slices, sliced lunch meat, two slices provolone cheese, roasted seaweed (nori), blueberries, raisins. 1. Cut whole wheat bread into rectangle, saving the crusts. Cut one slice of provolone cheese in half. Overlap the two slices to make the opening of the shirt and place on top of bread. Create the collar of the shirt, and the belt buckle, out of the other slice of cheese. 2. Cut two rectangles out of roasted seaweed and place them on top of the cheese to form the vest. Cut four more small rectangles and put them on top of the vest to make pockets. Put the cheese for the collar on top of the vest. Arrange the sandwich meat on the other slice of bread, form a sandwich, and place in the main compartment. 3. 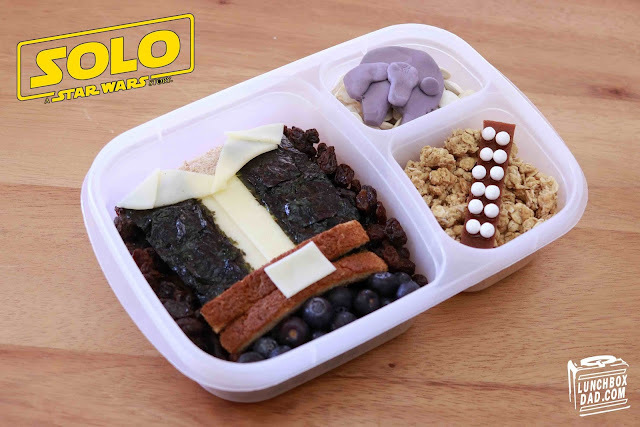 Drop in blueberries below the sandwich to make Han's blue pants. Use crust pieces and last rectangle of cheese to form the belt and buckle. 4. Surround the outside of the sandwich with raisins. 1. Drop seeds in side compartment. 2. Form gray fondant into shape of Millenium Falcon as shown and place on top of seeds.